Actress Emma Roberts sports a chic chunk of blue hair. For those who want a hint of new hair color without a total overhaul, dyeing just a chunk of hair may be the perfect solution. Whether you want your chunk to be thick or thin, subtle or colorful, the key is to color only that portion of hair -- any smudges or smears onto the rest of your hair will take your look from artsy to sloppy. A dyed piece behind your ear or under the top layer of hair will add a subtle dash of color, while a chunk right at the hairline will catch everyone's eye. Mix a small portion of your dye and apply it to a very small -- 1/8 to 1/4-inch -- portion of your hair in an inconspicuous place, such as behind your ear. Wait the amount of time indicated on your dye kit, then wipe the hair with a damp washcloth. This "strand test" is optional, but will give you an idea of how your hair reacts to the dye. If the color looks good, proceed. Section off the chunk of hair you want to dye with a comb. If your hair is long enough, pull the rest of it into a ponytail with an elastic to keep it out of your way. You can also pin the surrounding hair flat by pulling it against your scalp with your fingers and securing it with a bobby pin. If you hair is very short, you may not be able to separate the chunk from the rest of your hair. Put on gloves and drape an old towel around your neck and shoulders to protect your skin and clothing. If the chunk you're dyeing is near your ear or hairline, apply a thin layer of petroleum jelly to the skin to avoid staining it with dye. Mix the dye according to its directions. Cut a piece of foil large enough to fold over and enclose the piece of hair you're dyeing. If your hair is less than 3 inches long, your hair may not be long enough to fold into a piece of foil, so you can skip this step. Hold the piece of foil in one hand and place the hair on top of the foil. Using your dye brush, coat the chunk of hair completely with dye. Fold the foil lengthwise over the hair and up from the bottom so that the dyed chunk of hair is completely enclosed. If you hair is too short to wrap in foil, carefully paint the dye from roots to ends on only the chunk of hair you want colored. Wait for the amount of time indicated on your dye. You can open the foil every five minutes to check the processing -- be careful not to smear or completely unwrap the hair. Carefully rinse the dye with cool water, taking caution not to let the dye run onto the rest of your hair. Wash and style as usual. If you have dark hair or desire a drastic color change or vibrant color, you may need to lighten the chunk of hair first. Follow the same steps for lightening as for dyeing, but don't reuse your foil or gloves afterward; any leftover lightening product might alter the color of your dye. Use a new brush, or wash your brush thoroughly before dyeing. 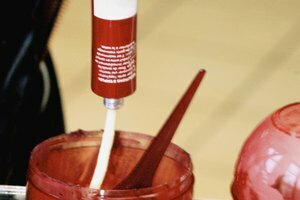 If you've never used the color or brand of dye before, mix a small amount and apply to your wrist. Wait 24 hours. If you notice any redness, burning or itching, rinse immediately and consider using a different product. Robinson, Lindsey. "How to Dye a Chunk of Hair." Synonym, https://classroom.synonym.com/dye-chunk-hair-20733.html. Accessed 18 April 2019.